In this cooperative game of humans vs. zombies, the humans must race to barricade all the doors and windows of a house, search the house for helpful items and weapons to defend themselves with, and they must do all this while fighting off an ever-growing horde of shambling zombies. The zombies, of course, just want to eat the humans. Zombies are slower than humans, but they make up for that shortcoming through sheer numbers. 2-6, with one player controlling the zombies. Can also be played solo, using automatic zombie movement rules. 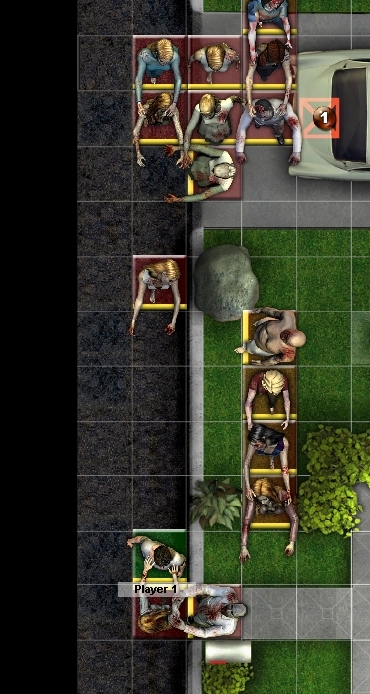 "Zombie Plague" is a Print-and-Play boardgame by Hackwerks Games. It was originally released in 1991, and has since developed a fan base which continues to refine and expand on the game system with additional expansions. The original Print-and-Play game can be downloaded from [urlx=http://www.fortressfigures.com/zombieplague/]here[/urlx]. This digital conversion of Zombie Plague for use with BRPG is being released with permission from the original designers. Zombie Plague is simple, fast, fun, easy to learn, and very strongly themed (it is very reminiscent of the classic George Romero zombie movie, "Night of the Living Dead"). Every game of Zombie Plague tells a story, almost as if you were in an interactive zombie movie. It's even fun if you get killed, since you come back as a zombie and can continue playing, now intent on killing your former teammates. Zombie Plague's game system is very flexible and highly suitable for tweaking (by adding house rules), if you are so inclined. The above download contains everything needed to play the game (including a BRPG-specific version of the rulebook) if you already have at least one GM Client license (v1.6m or higher). For multiplayer games, the extra players will need a Player Client or a GM Client. A player can also use the free BRPG Demo if the person hosting the game has a Floating License for them to use. Enjoy! And don't let the zombies get ya! Last edited by heruca on Mon May 16, 2011 9:58 pm, edited 2 times in total. 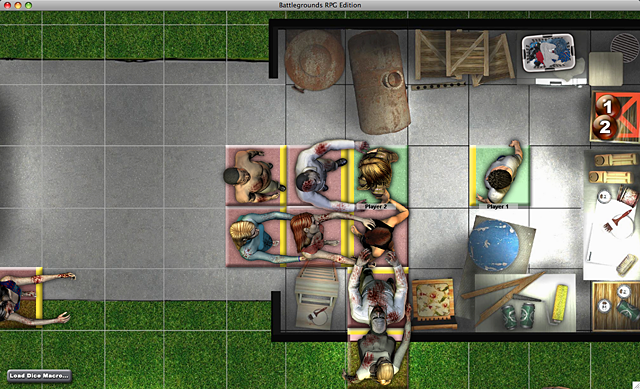 After launching BRPG, open the Dice Roller and select the "Zombie Plague" dice set. Doing so loads the custom dice that are needed to play the game, and failure to do this will result in bothersome dialogue prompts asking you to locate the custom dice files. The host and every player needs to do this. Also, if your Dice Roller window ever mysteriously disappears, select the "Browse Roll History" command to restore it. I'll try to fix these two issues in the next release of BRPG. Here's a screenshot of what the game looks like. Click on the image to view it at full size. Looks very cool! Cant wait to try it out. Thanks Heruca for more great free content! 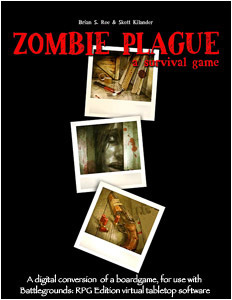 I should have mentioned this earlier, but there is now an Expansion Pack available for Zombie Plague. I just had a solo game. Good fun, but it took over 2 hours. That might be because it all went horribly wrong fairly early. My guy who found the axe got infected in the very first bite of the game, allowing five zombies to pour into the house (plus him) and after that it all went downhill! My humans were incredibly unlucky with their searching. Apart from the axe they only found the pistol, which ran out of ammo on the second shot after the first missed, the knife, which only hit once in the whole game, and the sledgehammer. The sledgehammer was great, but the guy who had it was surrounded by then and eventually went under. Cool to hear someone has finally played this. Spyke wrote: I just had a solo game. Good fun, but it took over 2 hours. That might be because it all went horribly wrong fairly early. If you use the Wound rules, games can drag out a lot longer. Try it without wounds and AP loss (getting bitten just means there's a 1 in 6 chance of being zombified, otherwise, no effect). I think you'll like it when you're in the mood for a quick game. Uhmm, there is no "driveway wall". I think you are referring to the curb, which is not an obstacle to movement. I think that's mentioned in the FAQ at the end of the rulebook. Ah yes, dropping the wound rule would tip things towards the Humans. Better if you don't want the angst! Although there is something glorious about the vain battle of the plucky humans against the hordes. Yes, that is in the FAQ as well. If it makes you feel better, I don't think I've ever won yet using the Wound rules. I think it might be best to limit the max. zombies to three per human figure, if using the Wound rules, to balance things out. In the other thread you mention letting the lead zombie break through as soon as a fourth member gets in line at a barricade, which is what I did in my first game. If we go with the rule as I think it's implied in the original rules, and only allow the zombies to break through on the turn after they get four lined up adjacent to the barricade it does slow them down, and may make the difference with the wounding rules. I was playing it this way in my second game, and was doing much better until an accident with the chainsaw. It's quite atmospheric this way, as you get a turn to react to a barricade about to break. One of the interesting things about this game is that house rules are the norm, and everyone plays it differently. I'll be sure to try it with your barricade-breaking rule the next time I play. The "advance warning" that a barricade is coming down sounds like a good addition (or, more likely, I've just been playing it "wrong"). Attached is a fix for the above-mentioned problem, so that you no longer need to pre-load the custom dice each session. To install, simply delete the "Zombie Plague" folder that is located inside BRPG's "Dice Sets" folder, then place the new files in the "Dice Sets" folder. This fix also includes the new dice types that were added in the Zombie Plague Expansion Pack. "100 times closer to a Romero movie than any other zombie game published. Beats the board games Maul of America, Last Night on Earth, & Dawn of the Dead on every count. More streamlined, colourful and above all it's a total blast to play." "Easy rules and quick gameplay, with some strategy thrown in, you can't beat that, especially when it's free!" "The atmosphere is great, the mechanics are pretty balanced and the final experience is a 10." "This is great with a few players also i think it can be quite enjoyable to play solo. The game is fun and challenging without being complex." "The amount of tension in this game can be pretty overwhelming and really keeps the players in the game." "Of all the zombie games I have played this one seems to catch the theme best." "This is the zombie game to play. No doubt about it. I have played and purchased others, but now they gather dust." "The best zombie movie I have ever played." I have uploaded a new version of the Zombie Plague zip file linked to in the opening post. This new version adds support for BRPG v1.6m, taking advantage of new features such as Views and antialiasing. I also fixed a problem I discovered in the original release, which would cause a fatal error if you tried to access the Reference item on a couple of the dice macros (because a needed asset was missing from the media bundle). Very cool. I might be grabbing this and seeing if Battlegrounds works on the missus computer (She' loves' zombies. lol). I think I have a player's license for her. If not... purchase time.